I’ve always found Scientology, the “religion” founded by science-fiction writer L. Ron Hubbard creepy. 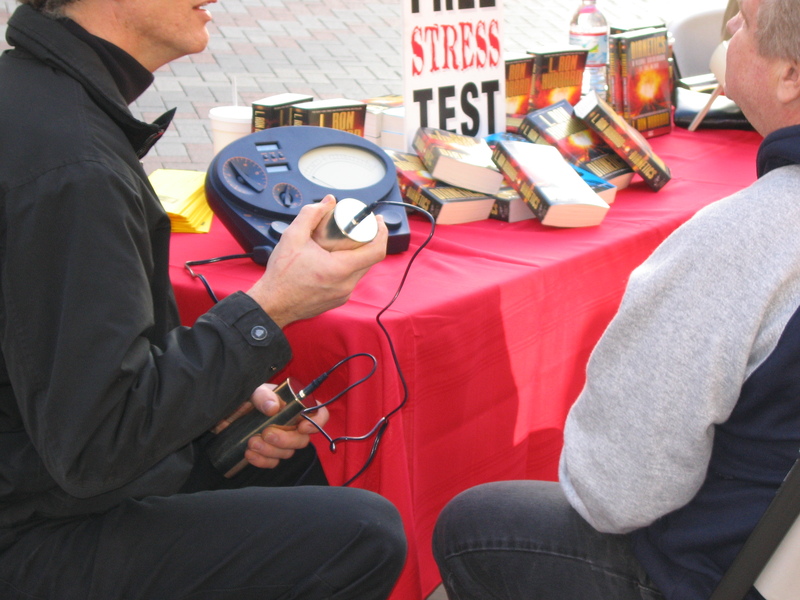 For one thing, there’s those people standing outside train stations and shopping centres offering free “stress” tests via a device called an “e-meter”. Then there’s the wacko celebrity endorsement from devotees like Tom Cruise (who infamously claimed in 2005 in a television interview that neither psychology nor psychiatry “worked”) and the claim at the core of Scientology that through elimination of the “reactive mind” (the unconscious mind) devotees can increase intelligence, eliminate unwanted emotions and alleviate a wide range of illnesses (including asthma, arthritis and sexual deviance, which is deemed to include homosexuality). But did you also know that L. Ron Hubbard was a supporter of South Africa’s white supremest apartheid government during its darkest days? I came across this little-known fact while reading a book about alleged ponzi scheme mastermind Barry Tannenbaum called “The Grand Scam” by investigative journalist Rob Rose. 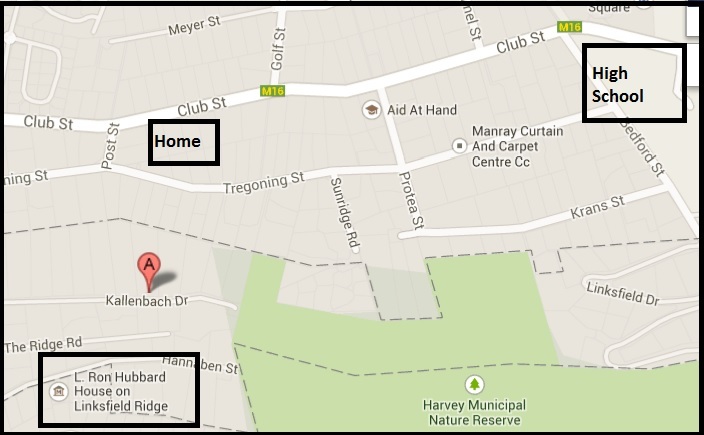 I also discovered that in 1960, L. Ron Hubbard lived in a house on Linksfield Ridge, Johannesburg just a few minutes drive from where our family once lived, though of course, separated in time by more than three decades. In a sense, we were neighbours, and I never knew it. 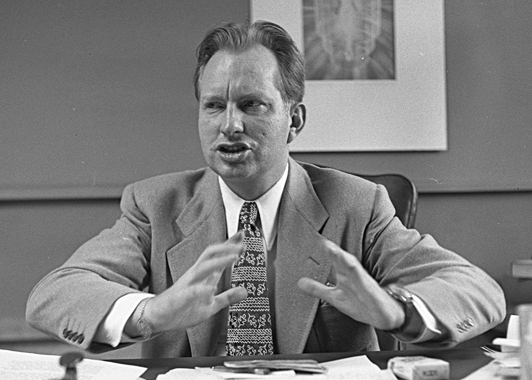 L Ron Hubbard came to South Africa in September 1960 and made his home on Linksfield Ridge, an outcrop of grass and rock. rising up over Johannesburg’s northern suburbs, dotted with gated townhouse complexes and multi-storey mansions. 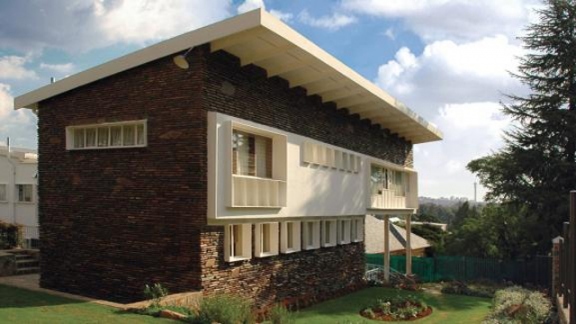 The Scientology house on Hannaben Street, which has impressive views over the tree-lined northern suburbs towards upmarket Rosebank and Sandton, has been restored as a museum. Had I known I would surely have visited. Of course the L. Ron Hubbard website, which has a special section devoted to Johannesburg, makes no mention of his admiration for former South African prime minister Dr Hendrik Verwoed, the architect of apartheid’s harshest laws. A polished, sycophantic video confirms Hubbard arrived in Johannesburg in September 1960, but that the home was a place for him and others to discuss and send off letters to the South African government detailing “his plans for equality in South Africa”. Quite, how he planned to do just that, cocooned in his luxurious castle in the heart of white Johannesburg is not explained though it does include the highly duplicitous claim that while there he delivered “Scientology spiritual counselling to the improve the lives of his African domestic staff”. Clearly then, L Ron Hubbard, was content to not just to live in luxurious surroundings, far, far away from the liberation struggle, but he was also happy to enforce the master-servant relationship that existed between white South Africans and black domestic workers, in his own home. This irony is not noted on the website either. May I state that you have conceived and created in the Johannesburg townships what is probably the most impressive and adequate resettlement in existence. Any criticism of it could only be engaged upon by scoundrels or madmen, and I know now your enemies to be both. For those wishing to verify this quote, you can find it here in a digital version of the Kotze Commission. This was set up in 1970 to investigate Scientology, and which then banned it for two decades (one of the few intelligent things the government at the time did). Of course, even if you dispute this transcript, it would take some distorted logic to understand why someone who claimed to believe in racial equality would choose to move to South Africa during the height of apartheid and live in an affluent white neighbourhood with black servants tending him hand and foot, rather than choose to live amongst African people in Soweto. Sadly, many South Africans are unaware of this fawning over the apartheid regime or choose to ignore it. According Rob Rose, since its unbanning in the 1990s, Scientology has gained 150,000 devotees in South Africa and earns about $10 million a year for L. Ron Hubbard’s church and estate.